F. T. Short, University of New Hampshire, Jackson Estuarine Laboratory, Durham, NH 03824; R. Cole, A. Freeman, E. M. Koch, M. Fortes. Trends documented at many of the 60 SeagrassNet (www.SeagrassNet.org) monitoring sites around the world support the idea that seagrasses are in crisis. Quarterly monitoring of fixed transects allows relatively rapid detection of change at sentinel sites worldwide. SeagrassNet results show seagrass declines to be overwhelmingly of human origin: both direct anthropogenic impacts and indirect effects from climate change. Site monitoring has documented significant trends of seagrass loss due to direct anthropogenic impacts like sediment loading from deforestation (Malaysia), resuspended sediments from tourism boating (Vietnam), and nutrient pollution (Maryland, USA; Placencia, Belize; Koror, Palau). We have also documented seagrass losses from climate change impacts through increased storm activity in Tamandaré, Brazil and excess grazing from altered migration patterns in New Hampshire, USA. Concomitantly, several remote or protected SeagrassNet sites are stable and healthy, e.g., Pohnpei and Kosrae (Micronesia), Puerta Puerto Galera (Philippines), and the Great Barrier Reef (Australia). The overall trend shown by SeagrassNet is one of seagrass loss in sites impacted by human activity and stable seagrasses in remote or protected areas. We predict that the crisis of seagrass loss will continually increase with expanding human-induced development and will be exacerbated by worldwide impacts of climate change. Who can tell the species name of the images? Please help me to identify the species name of the three seagrass. We are not sure whether you would like know any three species of seagrass. If so, here are the three species: Enhalusacoroides, Halophilaovalis, Thalassia hemprichii. However, if you would like us to idenfify any specific species, kindly please upload the photoes of those seagrass. 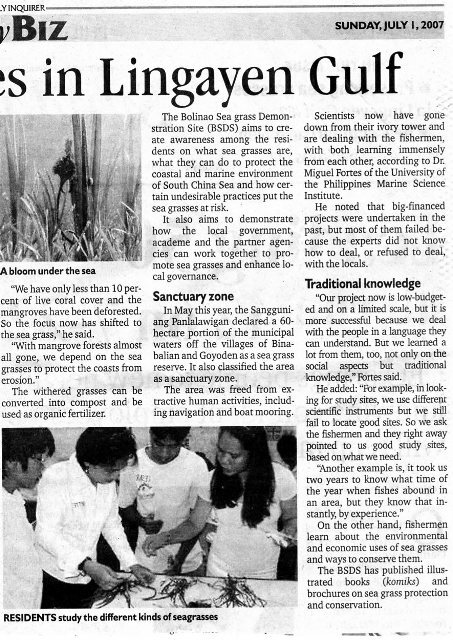 The Bolinao Seagrass Habitat Demonstration recently featured in National News in the Philippines. 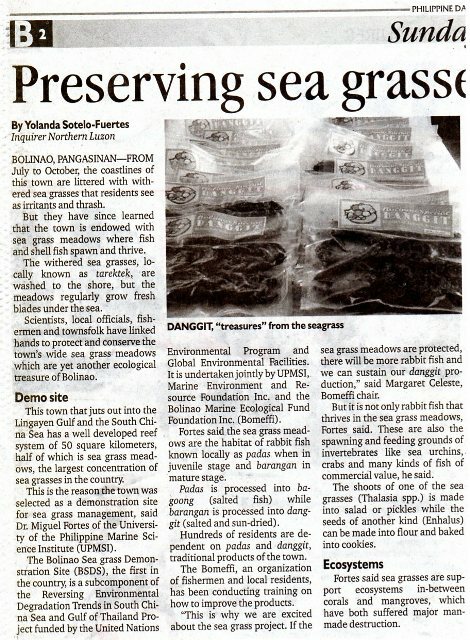 The following article was published in the Philippine Daily Inquirer on Sunday 1st July, 2007. 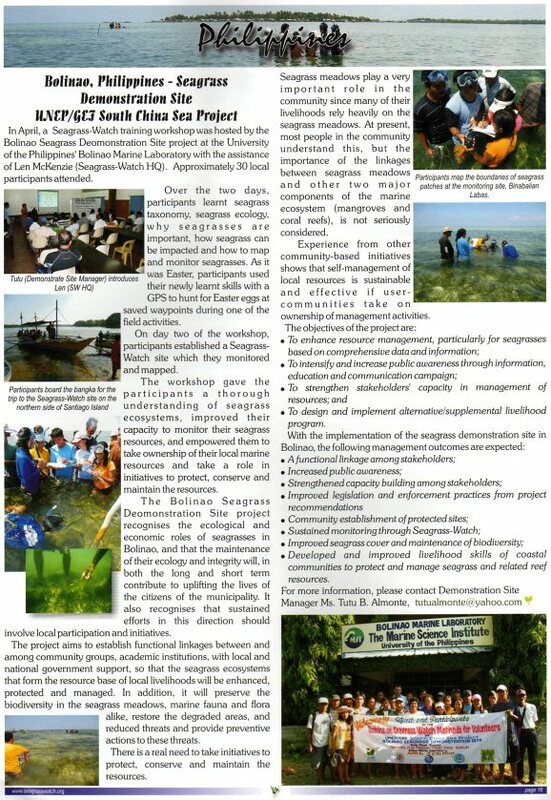 Here's another article on the Bolinao Seagrass Habitat Demonstration Site - this time from Seagrass Watch News.